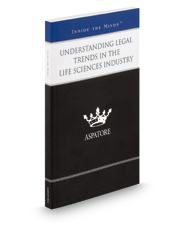 Understanding Legal Trends in the Life Sciences Industry provides an authoritative, insider's perspective on assisting clients with navigating domestic and international regulatory changes. Experienced partners from law firms across the nation discuss various issues impacting the life sciences industry, such as transparency, technological advances, marketing regulations, and safety practices. These top lawyers offer specific advice on building portfolios to withstand competition, implementing strong security practices to protect information, and helping clients overcome enforcement challenges. Covering a range of topics from understanding the Mayo Collaborative Services v. Prometheus Labs, Inc. decision on patentability to updating clients about ongoing compliance issues, these experts discuss the impact of Supreme Court cases on the industry and help develop risk programs to prevent future problems. The different niches represented and the breadth of perspectives presented enable readers to get inside some of the great legal minds of today, as these experienced lawyers offer up their thoughts on the keys to success within this ever-changing field.